John Kaneen (right) is presented with his award by Chris Thomas MHK. 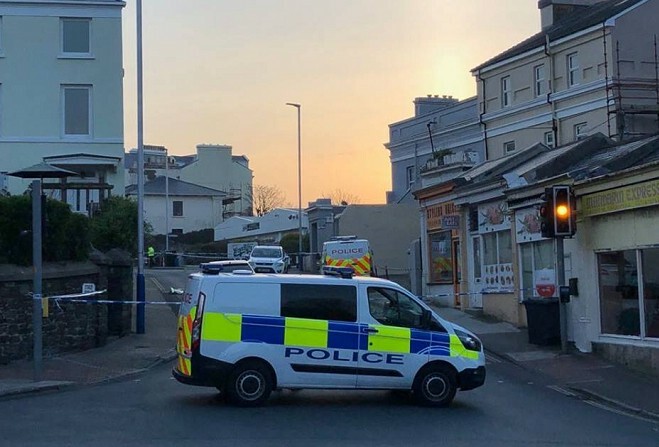 A voice well known to the Manx Radio airwaves has won the 2019 Reih Bleeaney Vanannan award - the highest cultural accolade on the Isle of Man. John Kaneen has presented the Folk Show for more than 30 years - a key part of his sustained and wide-ranging contribution to Manx life. 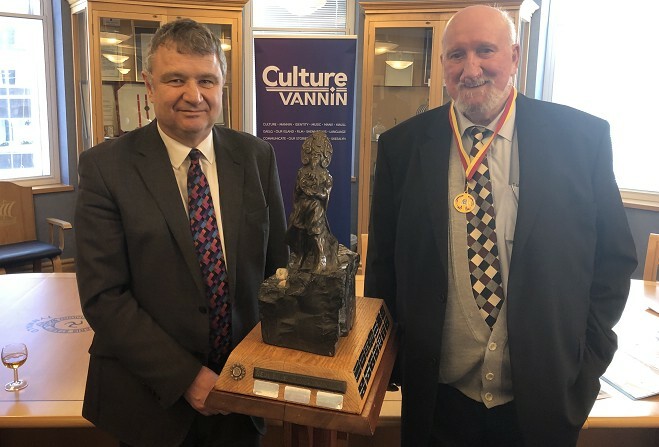 Culture Vannin described Mr Kaneen as a "superbly talented and larger than life musician, singer and dancer, and a quiet scholar of folk song", as he was presented with the award at the Legislative Buildings in Douglas this afternoon, before a small gathering of family and friends. Those nominating John spoke of his generosity, knowledge and modesty. John’s contribution to Manx culture and to a wider appreciation of folk music defies simple categorisation. A gifted musician, singer and dancer, he has been known for decades as a performer and as the lynchpin of the Calor Gas Ceilidh Band, which brought joy and laughter to a multitude of social gatherings, charity events, weddings and festivals. John has been a stalwart of the session scene for as long as he has been on the Island, and he has performed with Bwoie Doal, Bock Yuan Fannee, the Manx Folk Dance Society, the Manx Morris Dance Group, The Railroaders Skiffle Group and countless others. Known now as a button accordionist, he also played the concertina and guitar, and featured on the Manx dance cassette for Rinkaghyn Vannin (1986). He was awarded honorary membership of the Manx Folk Dance Society for musical services. 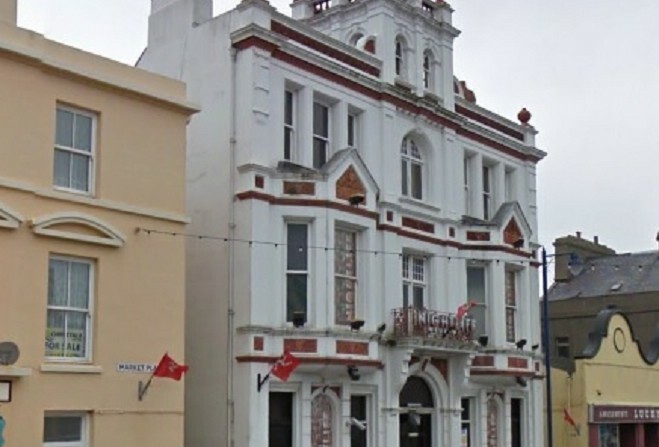 In the 1960s, together with David Callister (the Manx Radio presenter who would go on to become an MLC), John ran a folk club in Douglas, organising festivals and events, and was also a founding member and president of the Manx Ballads and Blues Club, which attracted such musicians and song-writers as Stuart Slack and Mike Williams. In the 1960s John went to live and work in Liverpool, became friends with the Spinners folk group and performed at many folk clubs in the Merseyside area. He returned to the Isle of Man seven years later. The late Colin Jerry recalled the time when copies were made of the Clague Collection of music at the Manx Museum, noting that John was among those who received one. Together with Colin, John edited A Garland for John Clague - A New Book of Old Songs, which reflected John’s extensive knowledge of British folk song collections, and the connections between song and tune titles within that wider context. Whereas Colin and others worked to promote songs in Manx, John retains a particular fondness for English language ballads and songs and has done much to promote them in the Island. Hunt the Wren saw terrific numbers on St Stephen’s Day 2018, and John is one of the people who must be thanked for this revival of interest. Together with Fiona McArdle, he has organised the Douglas Hunt the Wren for long years, raising money for charities including the RNLI. 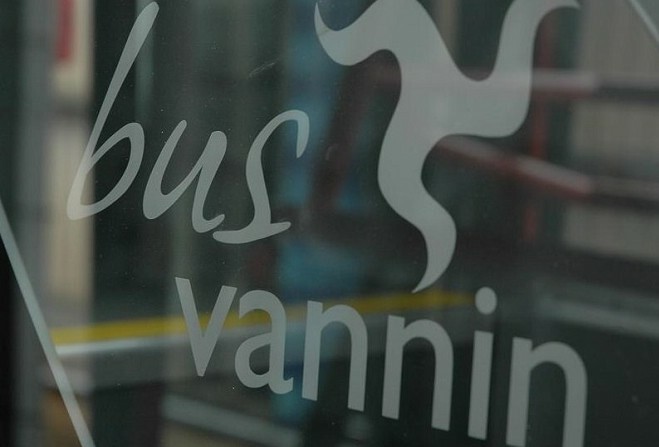 Yn Chruinnaght Inter-Celtic Festival was the backdrop for many a fine moment from John, but none more striking than his appearance as the Celtic sea-god Manannan, after which the RBV – Reih Bleeaney Vanannan – is named. In the early 1980s, fitted out in full length cloak and headdress, the towering figure of ‘Big John’ became Manannan, captured so beautifully in a photograph of him with the rather more diminutive festival founder, Mona Douglas. In 2008, Yn Chruinnaght re-created the scene, with John again prepared to take on the role on the proviso that no one set him on fire! John was also known for his interest in documenting events, setting up his recording equipment to capture concerts, sessions and other gatherings for posterity. His foresight didn’t stop there: as part of his Folk Show, John made the conscious decision to encourage young and new groups to record a session of their songs and tunes with him for broadcast. 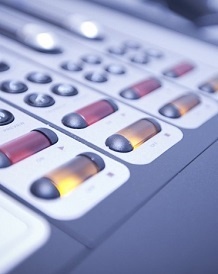 The show is enjoyed around the world, with listeners commenting on the encyclopaedic knowledge of the presenter.